The former director of the campaign that won the 2016 EU referendum urges supporters to "start rebuilding our network now" in a post on his blog. He says winning another EU referendum would be "easier than in 2016". It comes as he was found "in contempt of Parliament" by the Commons Privileges Committee. The committee says he refused to give oral evidence to an inquiry into fake news when ordered to do so in 2018 - he says he wanted to give evidence under oath but was ignored. 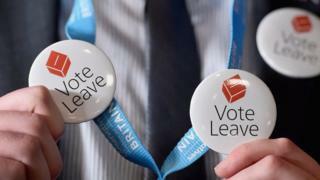 Vote Leave's use of social media data to target voters during the EU referendum has been the subject of controversy and it was recently fined £40,000 by the Information Commissioner for sending out unsolicited text messages. In his latest blog post, Mr Cummings urges former Vote Leave supporters to collect the names, email addresses, postcode, mobile numbers and full address "if possible" of friends and family "who you know are onside". "If we need to set up a new entity - a campaign, a party - you will be able to plug this straight into new data infrastructure and we will try to grow super-fast. And it looks like we will need to," he says. He also takes a swipe at the European Research Group - the group of Conservative backbenchers leading opposition to Theresa May's EU withdrawal deal. Referring to "the narcissist-delusional subset of the ERG", he says "so many of you guys were too busy shooting or skiing or chasing girls to do any actual work" during the EU referendum. "You should be treated like a metastasising tumour and excised from the UK body politic," he adds. "We won last time even though the Establishment had every force with power and money on their side," he writes. "They screwed it up because they do not have good models of effective action: they literally do not know what they are doing, as they have demonstrated to the world in the farcical negotiations. "They are screwing up their attempt to cancel the referendum. Beating them again and by more will be easier than 2016." Former UKIP leader Nigel Farage has returned to frontline politics as leader of the Brexit Party, in case Brexit is delayed further and Britain has to take part in May's European elections.